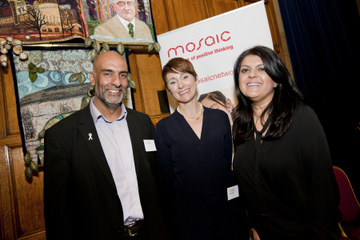 Mosaic has held a special event in Bradford to celebrate the excellent work being carried out by its mentors in support of disadvantaged young people across the Yorkshire region. Hanif Malik, CEO of the Hamara Healthy Living Centre in Leeds, was the keynote speaker for the event. He spoke with passion about the need to invest time and effort to help build the confidence and aspiration among young people, equipping them with key life skills. The Hamara Healthy Living Centre combines the functions of a traditional community centre, including youth groups, a café and social sessions for the elderly, with a focus on fitness via its gym and sporting facilities. The Centre also plays an active role in community relations, giving its support to anti-islamophobia and hate crime awareness initiatives.